Asthma is one of the most common diseases of the respiratory system. It affects children and adults, reducing quality of life and producing unpleasant and sometimes distressing symptoms of breathlessness and difficulty breathing. Asthma can often be well controlled with modern day asthma medications and it is important that you follow your asthma plan. However, in some cases asthma management is improved when you correct bad breathing habits and learn to breathe more efficiently and functionally. Many asthmatics have poor breathing habits (such as mouth breathing) and many develop some type of dysfunctional breathing [1, 2]. Mouth breathing and dysfunctional breathing aggravate asthma, decrease asthma control, increase medication needs and reduce quality of life. When these are present asthma symptoms are more severe and more difficult to control with medication. Correction of dysfunctional breathing can help some asthmatics to have better quality of life, feel less breathless and be more in control of their asthma [4-6]. There are many styles of breathing retraining and while most of these are beneficial to some extent, some are more effective than others . The best results seem to occur when the breathing therapy is able to correct the particular type of dysfunctional breathing that is present i.e. mouth breathing, hyperventilation, breathing pattern disorder or stress-related breathing change. To do this the therapy has to be individualised and sufficiently intensive in terms of patient practitioner contact and regular practice by the patient. Integrative breathing therapy begins with a breathing assessment to measure the extent of the various types of dysfunctional breathing. 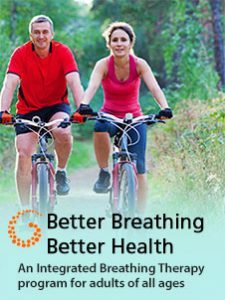 The Better Breathing Better Health program for adults is designed to address all the key types of dysfunctional breathing and also includes specific breathing exercises such as the Buteyko Method which have been proven to be helpful for adults with asthma. 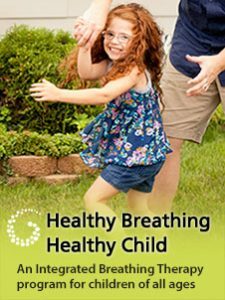 The Healthy Breathing Healthy Child program is designed to help children with asthma overcome dysfunctional breathing and manage asthma symptoms. Techniques from the Buteyko method and other breathing therapies are modified to make them suitable and fun for children. Osteopathic manual therapy treatment can be a useful addition to other sorts of treatment for asthma, including breathing therapy. Research has shown that manual therapy treatment helps to improve the mobility of the rib cage and biomechanics of breathing and patients report reduced breathing difficulty after this sort of treatment [8, 9]. For appointments for osteopathic assessment and treatment with Dr. Courtney please visit the appointment booking page. Kairaitis, K., et al., Route of breathing in patients with asthma. Chest, 1999. 116(6): p. 1646-52. Thomas, M., et al., The presence of dysfunctional breathing in adults with and without asthma. Prim Care Respir J., 2005. 14(2): p. 78-82. Shturman-Ellstein, R., et al., The beneficial effect of nasal breathing on exercise-induced bronchoconstriction. Am Rev Respir Dis, 1978. 118(1): p. 65-73. Hagman, C., C. Janson, and M. Emtner, Breathing retraining-A five-year follow-up of patients with dysfunctional breathing. Respiratory Medicine, 2011. 105: p. 1153-1159. Thomas, M., McKinley, R.K., Freeman, E., Foy, C., Prodger, P., Price, D.,, Breathing retraining for dysfunctional breathing in asthma; a randomised controlled trial. Thorax, 2003. 58: p. 110-115. Holloway, E. and R.J. West, Integrated breathing and relaxation training (Papworth Method) for adults with asthma in primary care: a randomised controlled trial. Thorax, 2007. 62(12): p. 1039-42. O’Connor, E., et al., Breathing exercises and/or retraining techniques in the treatment of asthma: comparitive effectiveness. 2012, Agency for Healthcare Research and Quality: Rockville, MD. Bockenhauer, S.E., et al., Quantifiable effects of osteopathic manipulative techniques on patients with chronic asthma. J Am Osteopath Assoc, 2002. 102(7): p. 371-5; discussion 375. Lowhagen, O. and P. Bergqvist, Physiotherapy in asthma using the new Lotorp method. Complement Ther Clin Pract, 2014. 20(4): p. 276-9.